Holding a sign embellished with barbed wire, senior English major Aiyah Sibay led a crowd of over 200 people in protests in front of McKeldin Library Wednesday afternoon. “When refugees are under attack, what do we do? Stand up; fight back,” chanted Sibay, the vice president of Students for Justice in Palestine at this university. Participants in the rally, which SJP hosted, shouted together as they advanced toward the Main Administration Building in solidarity with refugees and immigrants affected by President Donald Trump’s recent immigration executive order. 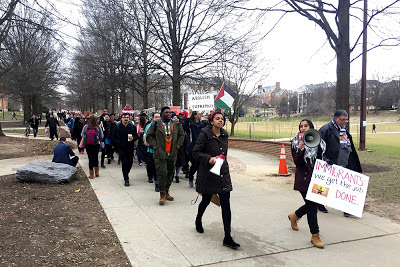 Miranda Mlilo, president of Students for Justice in Palestine, leads protesters on their march from McKeldin Library toward the Main Administration Building. Jack Wisniewski/Mitzpeh. Students walking to and from classes watched as participants marched to challenge the executive order, which imposed immigration restrictions on seven Muslim-majority countries. “We’re very familiar with idea of refugees, and if we’re lucky, we’ll raise awareness,” Sibay said. The ban affects some 350 people on this university’s campus and at least one graduate student’s return to the U.S. has been blocked, according to University President Wallace Loh’s email addressed to the student body Tuesday regarding the executive order. The SJP also sought to address Loh’s response to the 64 demands of ProtectUMD, a supergroup comprised of 25 student organizations. The demands included the declaration of this university as a “sanctuary campus,” and the implementation of prayer rooms in every major campus building. “We need a platform to voice our concerns, as they were pretty much ignored with President Loh’s response,” Sibay said. Aside from the demands which the university already satisfied, plans to satisfy, or must consult with the academic apartments and the University Senate, some are “unlawful, or impractical, or unnecessary,” said Loh in his email. Students and community members protested President Donald Trump’s recent immigration executive order in front of the Main Administration Building Wednesday. Jack Wisniewski/Mitzpeh. SJP promoted the rally through a Facebook event, which gained traction after coordination with other cultural student organizations, Mlilo said. 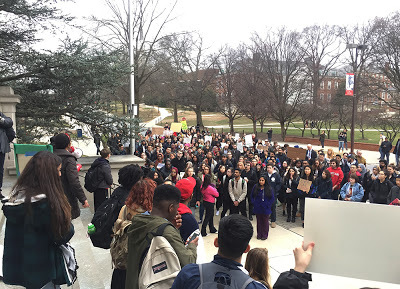 “We saw that there was no other rally organized and we knew that UMD is always at the forefront,” Mlilo said. Muhammed Ahmed, a sophomore computing information systems major at Baltimore City Community College, said many Muslims all over the D.C.-Maryland-Virginia area knew about the SJP rally. “I’m from Baltimore, I go to school in Baltimore, my mosque is in Baltimore, my whole life is in Baltimore, but I still knew about this,” Ahmed said. Senior history major Ethan Weisbaum said he attended the rally to play his small part in creating a safer community on campus for people who are not of his background. “We all have families that we love dearly and it would break our hearts if they were torn apart by policies which only create pain and suffering,” Weisbaum said. Backman’s Corner: What does it mean to be an educated Jew? No Replies to "Students march on campus to express solidarity with refugees, immigrants"